Back in 2004, I wrote an article about t-shirts for The Age. I wanted to explore the growth of t-shirts as design objects; the ways they were being turned into a fashion fetish and every second graphic designer seemed to be putting out a t-shirt line. But only the final three paragraphs of the final article are about this idea. The week I submitted it, there was a media panic about a provocative t-shirt that Westco made its retail staff wear, and so my editor changed the focus to be mainly about t-shirt slogans. This really annoyed me, but you have to respond to these news cycles. Today I was reminded of my lost article when reading this piece about innovations in the t-shirt market. I was particularly struck by its entrepreneurial streak: the point seems to be to identify trends to rip off in other markets. But I am interested in the closing section: "Blurring the lines between conventional displays and selling methods may well mirror your customers' blurring perceptions of what constitutes value, or experience." But as I see it, the success of the brands mentioned in the article doesn't just suggest a blurring of retail convention. It's about changing the basic relationship between product, seller and buyer. As Meaghan Morris writes in her classic essay "Things to Do With Shopping Centres", "it isn't necessarily or always the objects consumed that count in the act of consumption, but rather that unique sense of place"; and I guess what I want to do with this post is to use these examples of new t-shirt marketing as a sort of "place-making" - and as an antidote to the idea of t-shirts as "designer fashion". The commodities in a discount house boast no halo, no aura. On the contrary, they promote a lived aesthetic of the serial, the machinic, the massreproduced: as one pair of thongs wears out, it is replaced by an identical pair, the same sweatshirt is bought in four different colours, or two different and two the same; a macrame planter defies all middle-class whole-earth naturalness connotations in its dyes of lurid chemical mustard and killer neon pink. Second, commodity boudoir-talk gathers up into the single and class-specific image of the elite courtesan a number of different relations women and men may invent both to actual commodities, the activity of combining them and, above all, to the changing discursive frames (like shopping centres) that invest the practices of buying, trafficking with and using commodities with their variable local meanings. So, taking my cue from Morris, I want to sketch several "things to do with t-shirts". And importantly, the new "things" being done with t-shirts are succeeding because they create new spaces that manage to make the t-shirt simultaneously special and generic. First, there's customisation, in which the buyer alters the structure and look of the t-shirt in various ways. Then there's merchandising, in which the t-shirt itself remains unchanged; it's how the buyer interacts with its retail environment that constitutes innovation. Such merchandising techniques are what Morris would call a "discursive frame" - they infuse shopping with meaning. Clothing customisation has long been understood as a grassroots practice of bricolage - changing the meanings of clothes through a judicious and unexpected alteration of pre-existing items. Journalists still tend to get excited about its possibilities for creativity and individuality. I think the absurdity of such a stance is encapsulated in this phrase from NZGirl: "The only way to achieve individuality is by customising, and we're going to show you how..."
Mel: What would you do if someone came in with a seriously ordinary t-shirt that looked like they’d just taken a texta to a Bonds t-shirt in their bedroom? Dylan: And it was good or bad? Mel: And it was really bad. Dylan: Well, for a start we wouldn’t stock it because it was Bonds. Um, Bonds are about the only brand that actively, uh, go out of their way to stop people using their t-shirts. Dylan: Yeah, I think every other t-shirt brand is happy for their t-shirts to be used, but not Bonds. We’d just tell them we weren’t interested, I guess. That it wasn’t right for the store. Contrast the attitude of Bonds, a company that seeks to protect its brand from being 'ruined' by customisation, with American Apparel, a company that makes being generic its major selling point. American Apparel began as a wholesale business, selling t-shirts to artists, designers, bands and anyone else who needed a wearable canvas to print on. The company's selling points are quality, fit (slim fit - is it any surprise its biggest customers are hipsters?) and a rainbow of colours. But I do want to get away from the 'wearable canvas' idea, because it perpetuates the t-shirt label mentality that t-shirts are 'works of art in the age of mechanical reproduction'. Instead, let's look at two ideas that treat t-shirts as commodities in the most obvious way: by inserting them into the retail logics of entirely separate industries. 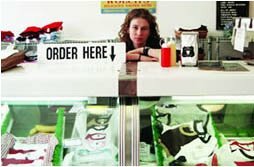 In Chicago, patrons at the Windy City's own T-Shirt Deli can order fully customised American Apparel t-shirts as easily as picking out sandwich ingredients. Indeed, the company's tagline is "T-shirts made fresh daily". Pick your desired size, colour and style out of a glass-fronted deli cabinet, then spell out a witty slogan in iron-on letters of a variety of typefaces (at US$1 per letter). You can also provide your own design. The final t-shirt is wrapped up in butcher's paper. The concept is similar to Neighborhoodies, which I previously discussed here. But while Neighborhoodies is a customising shop, plain and simple, I'm more interested by the food/fashion pun on 'freshness' employed by the T-Shirt Deli. Here, customising is a ritual of performing the 'fresh'. Rather than making your own sandwich at home, you go to a deli, and you feel more virtuous for resisting the temptations of the bain-marie. Moreover, you verify the freshness and healthiness of your lunch (and thus, your virtue) by seeing it made before your eyes. In a similar way, you go to the T-Shirt Deli because you want a product that could have been made by you. You feel better about yourself (more original, individual - more like a bricoleur) because you didn't just buy a pre-sloganed t-shirt. You thought up a witty catchphrase yourself. And the slogan looks especially good to you because it's being assembled right in front of you. 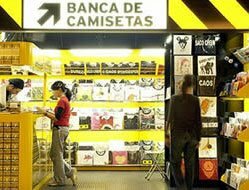 Brazilian store Banca de Camisetas(translation: T-Shirt Stand) is a kind of t-shirt newsagent. There are currently five ‘bancas’ in Sao Paulo. The merchandise is arranged in racks like magazines, the stock is changed weekly, and the store only carries three of each design. The ‘publishers’ are freelance graphic designers; from these photos, the shirts look a lot like the sort of stuff you can find at the T-Shirt Barn in Newtown, Sydney. But the intriguing thing about Banca de Camisetas is that, while its merchandise fits squarely into the 'art' aesthetic of the 't-shirt line', it isn't sold in a 'gallery' environment and the t-shirts are packed into squares. Instead, there's an accessible, 'convenience' mentality - just as you would in a magazine shop, you're encouraged to 'drop in', to browse, to choose quickly and to return often. I really like the way it refuses to treat the t-shirts as fetishes. However. Another thing that struck me is that the packaged shirts look almost like records, which in turn connotes another kind of retail fetishism - that of the hip, intense, mostly male vinyl hound spending hours browsing in music stores for rare discs. In every city there's a cartography of subcultural space marked out by spaces like these, and continually reinscribed by DJs and record enthusiasts. For example, in his article on death metal, "It'll All Come Out in the Mosh", Dominic Pettman refers to certain Melbourne metal record shops as the "Devil's Triangle". The good people at Springwise "can't really think of any big city where this would NOT work!" I agree. It's a great idea. But my contention is that a 'banca' would work in different, locally specific ways in different cities, because people would incorporate it into their existing repertoire of retail techniques. As Morris writes, if a company can create a sense of place, they can market a very banal product with great success. Bubble skirts are back! Well, they've been back since at least 2003 - at least in the minds of designers and on the runways of London, Paris and New York. We've had to endure endless fashion editorials telling us bubble skirts are back. And Australian designers including Rebecca Taylor, Mad Cortes and Jayson Brunsdon have been making them since 2004. Most people think of bubble skirts as a particularly 1980s trend; but they date back to the 1950s, when designers were experimenting with fabrics and silhouettes. This pattern is described as "harem draping", which makes sense if you think of the gathered ankles of harem pants. So, why haven't we seen bubble skirts on the streets until now? The key is the fabric used in a bubble skirt. You only get the true puffball look with stiff yet light materials like taffeta and raw silk - incidentally, the same fabrics popular in 1980s formal wear. And those were the fabrics used by Alexander McQueen, Marc Jacobs and Christian Lacroix in recent runway collections. There are dressy bubble skirts available this season at relatively upscale stores like Review, Cue and Bettina Liano. But the skirts that have made the trickle-down to high-street stores like Sportsgirl, Jay Jays, Valley Girl, Pilgrim and General Pants are very different. Made from cotton jersey, they're slinky and comfortable, heavily gathered from a basque waistband, without the pintucking you see on the more 'formal' versions. I've seen people on the street wearing these in two lengths: mini-skirt length and just below the knee. The mini version is cute and perky (and has been favoured by 'young' designers like One Teaspoon), but the longer version has a sculptural quality to it, and it moves fluidly and gracefully as the wearer walks. 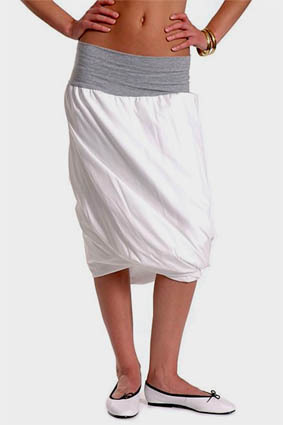 Incidentally, I hate Donna Karan's baggy jumper - it's the casual, relaxed skirt I'm interested in. I think this fluidity is the reason why bubble skirts are only just becoming popular among young buyers, and why we're only just starting to see them on the street as casual wear. I suspect that the bubble mini might well take the place in teen fashion currently occupied by the ra-ra skirt - a cute, disposable casual skirt with a retro feel. Worn with boots and opaque tights during autumn and winter, it might get even more popular. I'm also particularly interested in designs that play with the bubble skirt, twisting and deconstructing it in ways that complement the sculptural qualities of its soft fabrics. A few weeks ago, I was at an art launch where a woman was wearing a bubble skirt where the hem appeared to have been gathered and secured randomly at intervals. Rather than being smooth and puffy, the hem was puckered and asymmetrical. And I particularly like the Ed & Bek design pictured at the top of this post. It reminds me of sheets drying on a clothesline and billowing in a gust of wind.